I went to the site Real Clear Politics where they collect transcripts of political speeches. 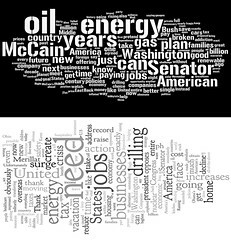 I took the last speech they had transcribed by Barack Obama and the last speech they had transcribed from John McCain and pasted both speeches into separate Wordles. The above image is what came out. The top wordle comes from Barack Obama's recent Townhall speech in Elkhart, Indiana. 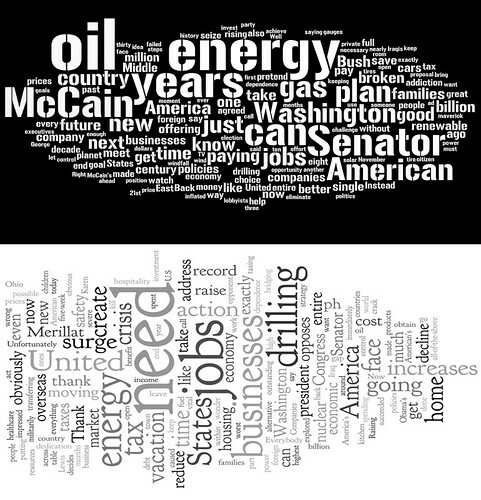 The bottom wordle comes from John McCain's speech in Jackson, Ohio. You can view this large here.